Lisa Carr (Brick Township), Renee Nebus (Brick Township) and Ryan Smith (Forked River) were presented three individual $500 scholarships during an award ceremony held Wednesday afternoon, September 19 on the Ocean Medical Center main campus in Brick. 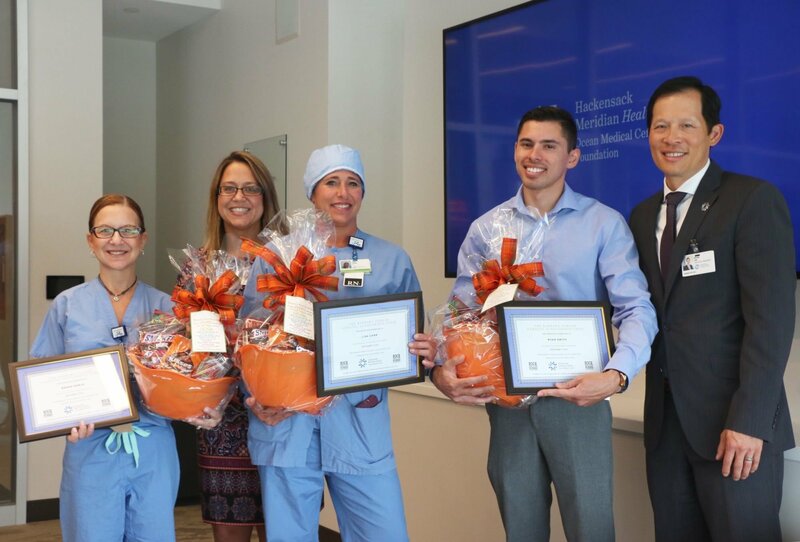 The 2018 ceremony marks the eight consecutive year that scholarships have been awarded to Ocean Medical Center team members from the scholarship fund. The three 2018 scholarship recipients were selected by the Barbara Forfar Nursing Scholarship Fund Scholarship Advisory Committee after the committee members reviewed all scholarship applications and supporting documents from every candidate who applied. Lisa Carr has been employed with the Hackensack Meridian Health System for eleven years. She began her career in healthcare as Registered Nurse and now is an exceptional team member in the Operating Room. Carr is a member of the Association of Operating Room Nurses (AORN), is certified as a CNOR and is a Clinical Resource on the CARE Clinical Ladder at Ocean Medical Center. She is an active member of the Operating Room Shared Governance Committee, Safety Committee and Green Committee. Lisa is pursuing her BSN Degree at Chamberlain College of Nursing with an expected completion date in July 2019. Renee Nebus has been a member in the Hackensack Meridian Health System for twenty-three years beginning her career in 1994 as a telemetry technician in Point Pleasant Hospital while attending Ocean County College. In 1996 she obtained her AAS in Nursing and has since remained a valued team member of Ocean Medical Center, first in Endoscopy and then moving to the Operating Room team at where she currently is assigned at present. She was mentored by scholarship namesake Barbara Forfar during her first several years in the Operating Room. Nebus has been a member of the Cultural Ambassador Committee since 2015 is also a member of AORN and holds national certification as a Certified Operating Room Nurse. Renee is pursuing her BSN Degree at Chamberlain College of Nursing with an anticipated completion date in December 2019. Ryan Smith is pursuing his RN Certification in Nursing at Ocean County College with an anticipated completion date in December 2018. After growing up in Southern California, Smith became certified as an EMT and then started employment at Ocean Medical Center in July 2016 as a Patient Care Technician in the Critical Care Unit. He has been in this department since joining the OMC team. Ryan also has keen interests in Operating Room, Emergency Room and ICU procedures. “I had the opportunity to get to know Barbara Forfar during my first several years in the Operating Room. She was an exceptional teacher for all the young nurses. She took me under her wing and I learned quite a bit from her” mentioned Nebus. “On behalf of the entire scholarship committee, I want to congratulate these three exceptional individuals who truly have a sincere desire and compassion for the Nursing profession and Nursing education just like Barbara did. All three recipients have an exceptional drive to gain as much knowledge as they can to help their staff, fellow team members and patients and have placed a priority on their own personal Nursing education to help serve all of us better. We wish all of them the best of success in their nursing careers” mentioned Walt Konopka, Chairperson of the Barbara Forfar Nursing Scholarship Fund. In addition to the scholarship recipients, their family members and friends, Ocean Medical Center physicians, nurses and administrative staff, other guests of note in attendance at the award presentation included Dean Lin, Regional President of Hackensack-Meridian Health, Ellen Angelo, Vice President of Ocean Medical Center; Dr. Teri Wurmser, Executive Director of the Ann May Center for Nursing at Meridian Health and Matthew Lang, Executive Director of the Ocean Medical Center Foundation. During its eight-year history, The Barbara Forfar Nursing Scholarship Fund has awarded $17,000 total to 30 nurses and nursing students of Ocean Medical Center. The 2018 scholarship application due date was July 19th. The Barbara Forfar Nursing Scholarship Fund was established on January 15, 2011 and is part of the Ocean Medical Center Foundation family of funds. The fund provides monetary assistance to qualified nurses and nursing students of Ocean Medical Center who desire to continue their formal education in nursing profession in the form of scholarships and awards one (or more) nursing scholarship during September of each year to eligible applicants. The Barbara Forfar Nursing Scholarship Fund was established to honor the memory of long-time Point Pleasant resident Barbara Forfar or “Foof” as she was called by her fellow nurses and other colleagues in the operating room, and her forty-four years of dedication to the nursing profession with all but three years of her service associated with the Ocean Medical Center or its predecessor hospitals. To qualify for the scholarship, the applicant must be an employee or nursing student at Ocean Medical Center and must be enrolled in a RN program, an upper division program (RN to BSN) or advanced degree program (MSN, PhD) in nursing. All Ocean Medical Center nurses and nursing students from all OMC practice areas are eligible to apply. The scholarship must be used to supplement tuition, fees, lab costs, books or educational supply expenses. The Barbara Forfar Nursing Scholarship Fund awards one (or more) nursing scholarship during September of each year to eligible applicants. For more information about The Barbara Forfar Nursing Scholarship Fund, including how to make a donation to the fund, log on to the official website at www.forfarscholarship.org or connect with The Barbara Forfar Nursing Scholarship Fund on Facebook or Twitter.